We specialize in wedding designs to meet each bride's expectations and budgets. We offer many rental items such as glass vases, arches, pedestals, aisle runners, wishing wells and the list continues. We prepare detailed wedding quotes for your floral needs. Weddings meetings are by appointment only. As a full service florist we offer delivery and we will set up and service the wedding. We will also prepare a wedding for pick up should it be decided this fits your budget better. 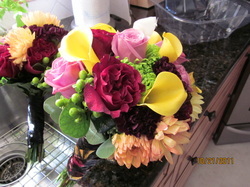 Examples of different bouquets can be viewed on the photo gallery page. All corsages are carefully wired stem by stem and not glued. We do our best to make your day worry free. Call today and set up your appointment.